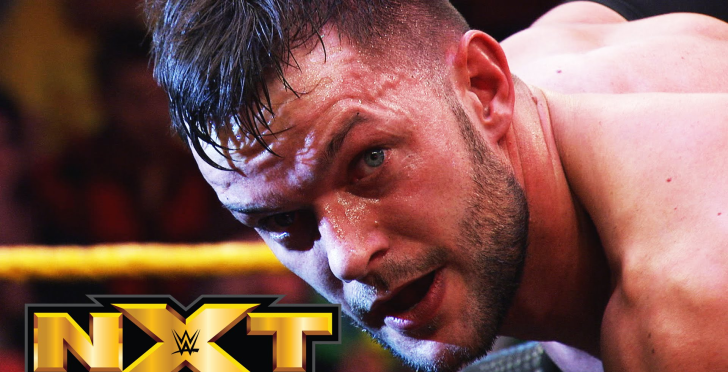 NXT Superstar Finn Bálor takes us through the key moments of his match with Tyson Kidd. File under: Gallery Updates Screen Captures WWE NXT WWE on YouTube! Balor hits an immediate dropkick before he heads up top, then Kidd bails outside and Balor gives chase and rolls him back in the ring. Kidd rolls out the other side so Balor follows him again, but Kidd slams him into the barricade and kicks him a few times. Kidd rolls him inside and hits a legdrop, then he taunts Balor a bit and hits a neckbreaker. Kidd applies a side headlock before he puts Balor in tree of woe position, then he stomps Balor a few times before Balor kicks him in the face. Balor hits a reverse bulldog and an enziguri, then Kidd falls outside so Balor hits a suicide dive on the ramp. Kidd connects with a kick to the head, then he hits a springboard elbow drop for two before he applies a Sharpshooter. Balor gets to the ropes to break, then he pulls Kidd through the ropes and hits an inverted elevated DDT (Bloody Sunday), followed by a top rope diving kick to the head for the win. Super-talented NXT star Finn Balor has singled out John Cena as his dream Wrestlemania opponent. Balor, 33, is currently plying his trade between the ropes of WWE’s highly-acclaimed developmental brand NXT and is considered one of the very finest talents in the world. When MTV expressed surprised he didn’t select Daniel Bryan, Balor responded: “I’ve a lot of respect for Daniel Bryan. “We’ve wrestled a couple of times on the indies before and we keep in touch. Balor, who has frequently teamed with Hideo Itami in Florida, also picked a classic Wrestlemania bout as his favourite match of all time. “[Wrestlemania 18], Hogan vs Rock,” he said. “Just pure electricity in the air, two of the greatest of all time. “What a story and what emotions… so Just off the charts. They go at it immediately with the dream team taking over. Ascension bails before the seated corner dropkicks can connect until it settles down to Viktor vs. Balor. Finn charges into the corner with a running chop before it’s off to Itami, who the fans are really excited to see. Back to Finn for more forearms and chops before Itami drops a knee for two. We hit the chinlock on Viktor as a Hideo chant starts up. Finn does a nice jump over the ropes to avoid a charging Viktor before kicking Konor off the apron. The distraction lets Viktor get in a big uppercut to knock Balor outside though as we take a break. Balor fights out of a chinlock from Konnor but the Ascension uses their old school double team beatdown to keep him in trouble. Off to a reverse chinlock from Konnor for a bit before a big uppercut gets two. Finn gets spiked like a football to break up a hot tag attempt as the beating continues. Slugging it out with Viktor goes as well as you would expect it to go so it’s back to Konnor to just hammer Balor in the head. The Pele Kick finally gives Finn an opening and the double tag brings in Itami and Viktor as things speed up. Hideo snaps Viktor’s neck across the top rope and scores with a top rope clothesline, only to walk into an STO for two. Itami teases the GTS again to another big reaction (and a GTS chant) but Konnor makes the save. Finn takes Konnor to the floor, leaving Itami to kick Viktor in the head for the pin. We are back and we are told that Hideo Itami and Finn Balor will face The Ascension one more time next week on NXT. Itami and Balor were asked about the match. Hideo mentions that the Ascension tried to ruin his debut and next week they destroy the Ascension. Finn says that they were greeted by the Ascension on their way in, but they will send the Ascension out the door. Following his tag team victory alongside Hideo Itami at NXT TakeOver, Finn Balor gives a strange explanation of his incredible transformation. File under: Gallery Updates Screen Captures WWE on YouTube!